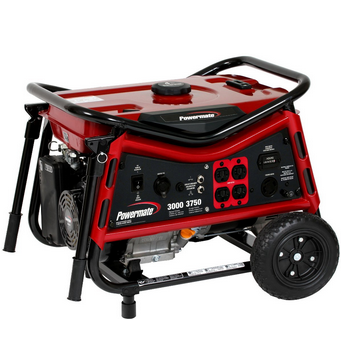 The Powermate PM0103007 Gas Powered Portable Generator is a great buy if you are looking for an inexpensive, reliable generator to power just a few tools or the basics at home during power outages and extreme weather. The Powermate PM0103007 portable gas generator is available on Amazon.com for around $400. Anyone needing to use small power tools and equipment while on the road could benefit from this Powermate PM0103007 generator. It can also be used for powering the basics for your home when the power is out. This inexpensive portable generator is not only affordable to buy, but it is economical to run. 4 gallons of gas in the fuel tank will buy you up to 11 hours of use at 50% load. That is a decent time span for you to have a generator running and not worrying about it running out of fuel. A couple of nice features on this basic unit is the safety low oil shutdown, to provide protection for the engine. There is also a handy hour meter to give you an idea of running time, and allow for proper timing of oil changes and maintenance. The 212cc OHV engine is designed to be fuel-efficient, easy to maintain and reliable. It gives approximately 3750 surge Watts, with a regular 3000 Watts of running power. There is an automatic voltage regulator to keep your appliances safe. The unit gives output from the following receptacles, two 120v 5-20r duplex outlets, a 120/240v l14-30r outlet and a useful 12v battery charging outlet. This generator equipment also comes with dual folding handles and wheel kit with 8 inch diameter never-flat tires that take approximately 15 min. to install. This Powermate PM0103007 is a great portable generator for the money. Affordable to buy and to run, this reliable little generator should give you enough power for what you need.